Keeping your vehicle in excellent condition means taking care of what’s on the exterior as well as the interior. Through your daily travels, you’ll encounter unfortunate accidents, from minor fender benders to major collisions that leave you without your transportation. At Scott’s Body Shop, we understand that collision repairs can be as much of an inconvenience as the collision itself. We understand the unfortunate circumstances under which you’re visiting our repair facility. If it were up to us, and definitely if it were up to you, you’d never need our services. But if your vehicle’s been in an accident, then you’re just looking for the best. It seems like your luck is starting to turn, because you’ve found Scott’s Body Shop, the best auto body shop in the Big Rapids area. Our reputation for top quality auto repairs is well established, and we specialize in complete auto body restoration. You thought your pride and joy was “totaled,” but we will put you back behind the wheel in no time. Even when you drive with caution, accidents can happen. Whether the vehicular accident is your fault or not, you’ll still need a quality collision repair facility to get you back on the road safely. Scott’s Body Shop in Big Rapids, MI has the tools and experience to service everything from minor fender benders to major damage that you may even think is beyond repair. 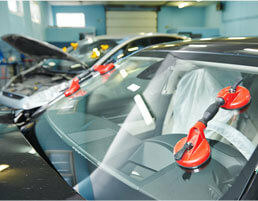 Our team specializes in complete auto body restoration. Whether you have dents from hail or minor collisions or parking lot dings, unsightly dents bring down the value of your vehicle. 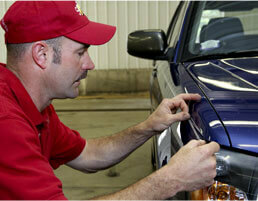 Many drivers put off getting dents repaired because they are worried about the cost. Scott’s Body Shop in Big Rapids, MI specializes in paintless dent repair, which is less costly than traditional repair and preserves your vehicle’s original paint finish. We can make dents disappear without the use of paint, sanding or body fillers. Continuing to drive with a slight crack in your windshield is dangerous and very distracting. Although cracked glass doesn’t necessarily stop you from being able to drive, even a crack that has been caused by the smallest pebble can grow to severely compromise the safety of your vehicle. Let the Scott’s Body Shop experts restore your vehicle’s glass so you continue to experience a fully-secured cabin. During collisions it’s common for a vehicle to sustain damage to its suspension and steering systems. When the suspension is off on your vehicle, you lose the control you usually have while driving - compromising not only your safety, but also that of other drivers on the road. 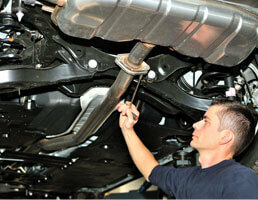 Our expert technicians can perform your suspension repair and get you back in control in no time. Whether you’ve been in an accident, or if your suspension has just undergone normal wear and tear, Scott’s Body Shop is your best bet for suspension repair in Big Rapids. 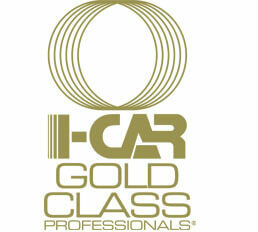 We are an I-CAR Gold class facility - a distinction that only about 10% of collision repair shops receive. When your car has been in a collision, it’s important that you get it repaired safely. But how can you distinguish a responsible technician from someone who will cut corners on your repair? I-CAR (Inter-Industry Conference on Auto Collision Repair) is a well-known international nonprofit auto technician training organization. The I-CAR Gold Class designation lets you know that a collision repair shop has highly trained technicians who know how to properly repair your vehicle - and only about 10% of collision repair shops meet the standards for this recognition. Give us a call today for a fair estimate for your vehicle’s collision repairs. Our team specializes in performing the collision repairs that you didn’t think were possible. Your car may not be totaled, it could just need some extra attention! Give Scott’s Body Shop the opportunity to show you what we can do for your vehicle by requesting an appointment that’s convenient for you. Our online scheduling system makes every repair easier. We’re just one click away! You need an auto body shop that you can trust. Whenever an unfortunate accident happens to a Big Rapids driver, we should be the first shop you see. Don’t let the insurance companies decide the fate of your vehicle. You probably had no intention of losing your precious vehicle, and we have no intention of letting you. Our team is highly trained and very experienced in complete vehicle restoration. Scott’s Body Shop turns all the stress from your vehicle’s collision into joy over the return to its original condition. We get you back on the road sooner than you imagined. Our team places a high premium on customer service and convenience. From the moment we meet you, your vehicle, and start meeting your repair needs, you become our #1 priority. Just let us know what else we can do to make your collision repair experience even more convenient. The Auto Body Shop You’ve Been Looking For! Scott’s Body Shop in Big Rapids, MI is your go-to shop for any collision repairs. 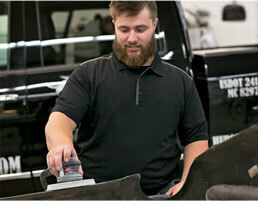 Let our friendly staff get you quickly and efficiently back on the road to vehicle restoration. Our team has complimentary shuttle service available to make this process smooth as possible. Just give us a call so we can give you an estimate and let you know exactly what we can do for you. For your convenience, you can go ahead and schedule your appointment right now, using our online scheduling system. We look forward to serving you! We offer a Lifetime Warranty on collision repairs. Please ask for information prior to scheduling your repairs. Our collision service expertise includes many top industry certifications, including I-Car Platinum and PPG (Paint Performance Guarantee) Certifications. Scott’s Body Shop offers the option to receive text message or email status updates for collision repairs to help you manage your busy schedule. Can’t wait while we service your vehicle? No problem! At Scott's Body Shop, we provide a free local pickup and delivery service. No time to schedule an appointment? No problem! At Scott's Body Shop, walk-ins are always welcome! Scotts Body Shop performs expert auto body repairs and maintenance for all makes and models of foreign and domestic vehicles.